Why do I get the Cannot find procedure "glmXXXCmd" error when I click an icon? Why do I get " Geometry File is invalid " error when using the Golaem Character Pack? How to send your scene to Golaem Support? Where to find assets for Golaem Crowd? Maya crashed, what can I do? Can I install multiple version of Golaem? What's the Crowd Unit? How do I set it? Where are the Crowd Entities at Frame 1? 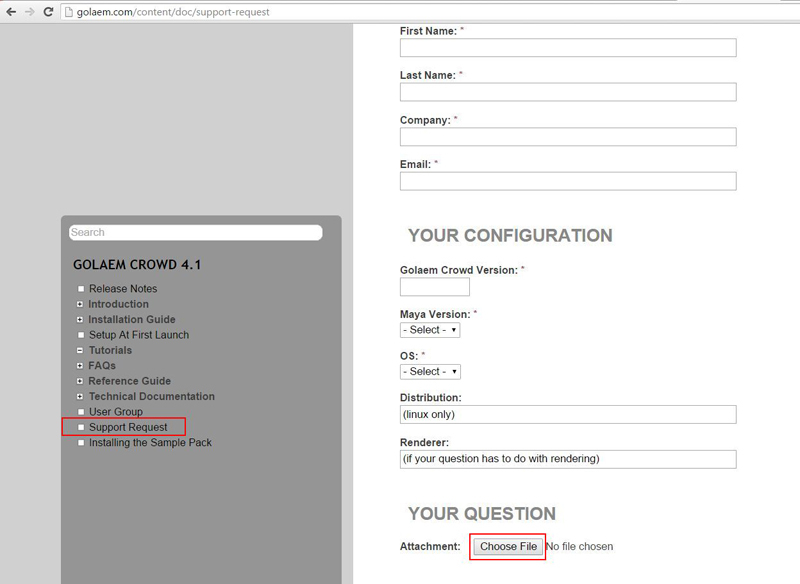 It seems that although the Golaem Crowd shelf is visible, you did not load the Golaem Crowd plugin. It happens, even to the best of us! Error: [Golaem]: The Geometry File 'CMO-man_golaem_light.gcg' assigned to Entity '0' is invalid! If you have this message when using the Golaem Character Pack files, it probably means something went wrong during installation (the final path replacement script was closed before it could ends). Golaem is probably looking for files in P:/. Another way is to adjust these paths manually in the Geometry part of the Golaem Character Maker, see an example here. However, after doing this, you will also need to adjust the textures path in the /shaders maya scenes as well as some other paths in the sample scenes. A license is required to run Golaem Crowd on an artist workstation, NOT for the render nodes. Basically, all commands modifying simulation or assets will draw a license on the calling machine, a license is NOT needed for all steps after simulation export: rendering using a proxy or procedural shaders. 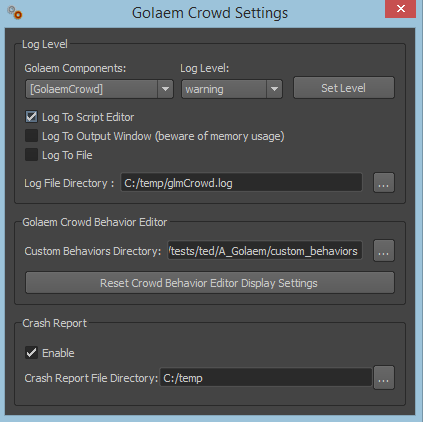 Golaem Crowds comes with the handy Crowd Archiver node which includes Golaem Crowd files in a Maya archive. If you don’t want to send us your scene textures (which could generate a big file), delete your shading reference character and then go to the HyperShade and select Edit/Delete Unused Nodes before archiving your scene. When you are ready to archive just go into the file menu and click on the Archive Scene menu to create a .zip file with all the needed file included. If the size of your archive is too big, either use wetransfer (or any other transfer service) or your FTP. As it's possible to select the different scene assets you send us, please make sure to check the Simulation Cache checkbox if you are facing a rendering issue. There is a lot of great websites to create or catch stuff to work with Golaem Crowd, here are a few of them. WHERE TO FIND RIGGED CHARACTERS? WHERE TO FIND MOTION CAPTURE DATA? 1.Open the Golaem Menu / Settings Menu. Enable the Crash Report and note where the Crash Report File Directory is located. 2. Reproduce the crash once again, a .dmp file will be written at the specified directory. You may now send it to your favorite support team. Dmp files contain information that only the Golaem team can read and does not store anything related to the scene. As Golaem relies on Maya Modules architecture, several versions of Golaem can coexist on a same system but only one can be loaded at the same time in Maya. 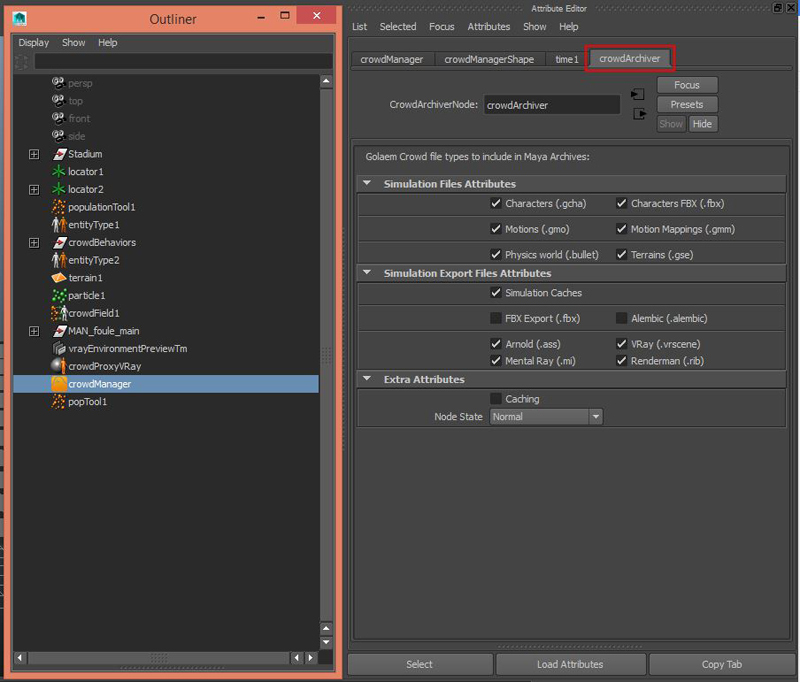 Set the MAYA_MODULE_PATH environment variable to select which version will be loaded in a Maya session. That's a pretty common question! Thanks for asking! Thus, just as Maya, by default Golaem assumes that distances, velocities, gravity of the Golaem nodes are defined in meters. The Crowd Unit helps changing what's the actual unit of your environment. It's important to set the Crowd Unit depending on your environment and not depending on your Golaem Characters. If required, Golaem Characters can be rescaled to be adapted to the environment using the scale attributes in the Crowd Manager, Crowd Field and / or Entity Type Node. Let's illustrate Crowd Unit with a use case: consider a door object (and assume it's a regular door 1m width * 2m height). Middle: door mesh 10 Maya units width * 20 Maya units height => 10 Maya units equals 1m => 1 Maya unit equals 0.1m => Crowd Unit has to be in decimeters. Right: door mesh is 100 Maya units width * 200 Maya units height => 100 Maya units equals 1m => 1 Maya unit equals 0.01m => Crowd Unit has to be in centimeters. In the Crowd Manager Node, when starting a new scene. Finally notice that the Crowd Unit has to be set in the Crowd Manager Node BEFORE a Population Tool is created and Behaviors are applied. The default value of the Crowd Unit can be set by using the GLMCROWD_UNIT environment variable.